This is the story of a P.A. (Physician’s Assistant) in San Francisco who wakes up one day to discover that the city, the country, perhaps the world have been wiped out by “the Women’s Plague.” The virus causes babies to be stillborn, the mothers to die in a raging fever during delivery, and 98% of the males to succumb as well. 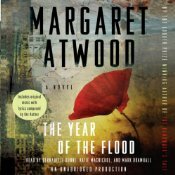 As the eponymous character moves though the post-apocalyptic landscape, she does what she needs to do in order to survive and search for meaning in this life. The novel is heavy with import; but it suffers from a surfeit of story, in particular the passages regarding another character’s journey; and some underdeveloped ideas, like hives (a single-female-led colony of male acolytes.) 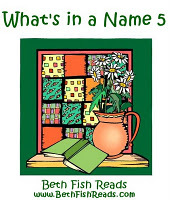 The author also includes a couple of “off-camera” scenes – passages which describe action that could not be known to the main character or others, which can be immediately gratifying to the reader/listener, but breaks the integrity of the narrative. The blogger, The Guilded Earlobe also listened to and reviewed this title; and gave it an “A”rating! Check out what he had to say about it HERE. OTHER: I purchased The Book of the Unnamed Midwife (by Meg Elison; narrated by Angela Dawe) from audible.com. I receive no monies, goods, or services in exchange for reviewing the product and/or mentioning any of the persons or companies that are or may be implied in this post. The Book of the Unnamed Midwife (by Meg Elison; narrated by Angela Dawe) is a finalist in the 2017 APA Audie Awards in the Science Fiction category. EDIT: Added line and link to The Guilded Earlobe’s blog post/review. “A long time ago, in a galaxy far, far away…” the fates and destinies of Poe, a brash young pilot carrying a spherical droid named BB8; Rey, a scavenger on the desert planet, Jakku; and a disillusioned Stormtrooper named FN-2187, would cross to create a story of adventure, loyalty, danger and intrigue. The movie would return the iconic space opera franchise to its original core values in storytelling, picking up the story a generation after Star Wars: The Return of the Jedi (Episode VI) left off. Alan Dean Foster has written the official novelization of the movie; and given that the audio was a simultaneous release with the film, it stands to reason that he was privy to a working script and/or an advance screening to insure the storylines would match. As such, if you have seen the movie, there are no surprises or Easter eggs here; But if you were unclear as to what happened in the movie at any point (e.g. Did Finn die? Or was he just gravely injured?) the (audio-)book will answer those questions. 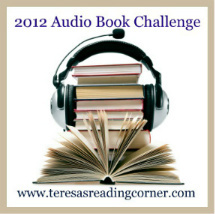 The audiobook is a hybrid of an audio drama (sound f/x and music) and straight narration (single narrator reading all the text and dialogue.) The sound effects can help with the immersive experience, and also help trigger recall to the movie scenes when the the action lines or settings are not clear in the writing. However, the sound effects can also be distracting to varying degrees from mildly irritating to getting in the way of the story itself. The demands of a Star Wars audiobook narrator are a little different than from an audiobook narrator of a regular novel: The narrator works from a Foley script (but with no actual sound effects being played during the recording); has very little input from Disney/LucasFilm and/or the author in regard to characterizations; and must deliver in a style that can seem over-the-top. As a result, the narrator’s performance is spliced with sound f/x and at times has an odd chopped quality to it; some of the characterizations might seems a bit “off” from what you recall from the movie; and the melodramatic tone, while serving intense scenes, can verge on the comical when more subtlety might have been expected. Nonetheless, it must be noted that Marc Thompson did extremely well in handling the script and the unique demands required of him. His voice characterization for the now-older Han Solo was particularly well-done; though General Leia Organa, not so much. This is a fun, family friendly audiobook that will appeal to listeners who enjoy radio and/or audio dramas, and Star Wars fans. 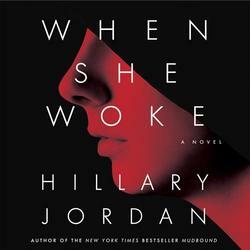 OTHER: I listened to a CD copy of Star Wars: The Force Awakens (by Alan Dean Foster; narrated by Marc Thompson) that I borrowed from the Jackson County Library Services (Southern Oregon.) I receive no monies, goods, or services in exchange for reviewing the product and/or mentioning any of the persons or companies that are or may be implied in this post. Star Wars: The Force Awakens (by Alan Dean Foster; narrated by Marc Thompson) is a finalist in the 2017 APA Audie Awards in the Science Fiction category. Wade Owen Watts is a teenaged gamer escaping the reality of life in the stacks (RVs and trailers stacked one atop the other in towers) in Oklahoma City. The year is 2044 and it’s the third decade of The Great Recession in America. Infrastructure has deteriorated and people look to the cost-efficient technology of virtual reality for entertainment and education. In fact, the “massively multi-player online virtual reality reality game” of OASIS has become for many, the preferred existence: a place where you can create a better version of yourself and live a more interesting life. “Parzival” is Wade Watts’ avatar in OASIS and Parzival is playing a contest within the realms of OASIS, a game within the game wherein the objective is to locate three keys that will ultimately lead to an Easter egg. The winner of this contest will inherit Jame Halliday’s (co-creator of OASIS) fortune and interest in G.S.S. (Gregarious Simulation Systems) – the company that has top administrative control of OASIS. The power and revenue of this fortune and interest are immense and so the competition for each of the keys and the Easter Egg is stiff. Wade/Parzival must battle IOI, a mega-corp with deep resources, both in OASIS and IRL for the Easter Egg. Ready Player One is the ultimate story about quest gaming and what makes it more fun is that OASIS is an homage to the 1980s – a time when computer generated gaming starting elbowing out the pinball machines in arcades. There are references to the arcade games themselves (in fact Parzival plays them – in effect becoming an uber meta-gamer in that he’s playing a game within a game within a game that has IRL consequences) as well a number of other cultural references from the eighties. If you’re not a gamer or not familiar with the references, you might feel like you’re missing something; but most of it is sufficiently explained to ameliorate any bewilderment; but if you are familiar with gaming and/or remember the eighties, Ready Player One flows without seeming didactic. 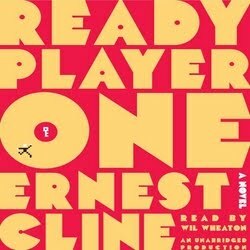 Ready Player One is a fun, clever story and the audio is an equally fun and clever production in its choice of narrator. Are you old enough to remember the ’80s? Were you a gamer? What games did you play? I was a teen during the eighties and I played some arcade and console games. At the arcades, I played Pac-Man, Ms Pac-Man (table top), Asteroids, Galaga, Centipede and Millipede. At home I had a Fairchild Channel F console which played cartridges. I distinctly remember a tank game, Desert Fox! My sister got an Atari 2600 and we played Pac Man, Asteroids and Missile Command. I remember my-then BFF, “A” (of Amityville Horror fame) had Pong! Do you remember the gaming wars? Atari vs Intellivision!